On Tuesday, 14 February 2017, the US representative office of the National Council of Resistance revealed in a press conference in Washington D.C. new information about the Islamic Revolutionary Guard Corps (IRGC) hosting terrorist training camps for foreign fighters. 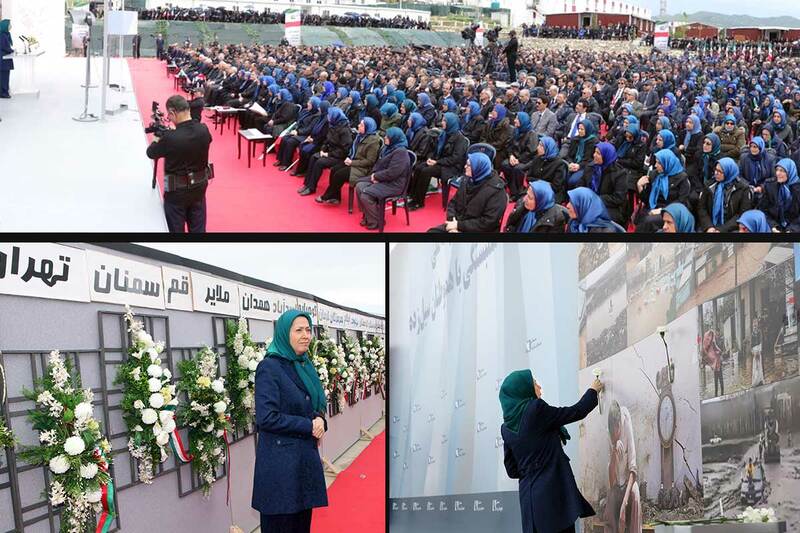 The information was obtained by the network of the Peoples Mojahedin Organisation of Iran (PMOI/MEK). The network has found that every month, hundreds of forces from Iraq, Syria, Yemen and Afghanistan -- countries where the regime is involved in frontline combat -- receive military training before being returned to their home countries. Other, smaller groups are also trained in other countries for terrorist acts and operations. For operations in countries where there is no open warfare - including Persian Gulf countries such as Bahrain and Kuwait -- terrorist teams are trained. The NCRI further revealed that in addition to the forces who are trained for military action as part of the regime’s overall meddling in the region, terrorist units of the Quds Force are also trained in separate and secret units and are dispatched to various countries. The destructive role of the IRGC and its involvement in terrorism is “beyond reasonable doubt” under the highest standard of a court of law. Right from its inception, simultaneous with its role in suppression of the Iranian people, it has been engaged in terrorist activities throughout the region. It created Hezbollah in Lebanon in early 1980s, which took Western hostages under IRGC direction. In 1990 the IRGC set up an extraterritorial Force called the Quds Force, which aimed to further expand its meddling in other countries and its support for terrorism. There was very little European response to hostage taking in the 1980s and to increasing numbers of assassinations of Iranian dissidents in Europe. Europe certainly failed to grasp the devastating consequences of its conciliatory policies. Those consequences included but were not limited to emboldening terrorist acts by the IRGC and its affiliates. Western neglect of the IRGC effectively encouraged Sunni extremists to counter Iranian influence by taking the same path and resorting to their own terrorism in pursuit of their objectives. After all, if Iran can force Europe to make concessions by resorting to terrorism and blackmail why wouldn’t other extremists follow the same path? Today, where does Europe stand on the IRGC and its role in Syria? Where does Europe stand on the IRGC’s role in formation of paramilitary terrorist groups in Iraq or its role in Yemen helping the Houthi? Are they still failing to recognize the connection between the IRGC’s spread of extremism and terrorism and the negative impact of their own policy towards the heart of Islamic fundamentalism? Despite the IRGC’s undeniable conduct in Syria, which can only be described as war crimes, and despite its role in domestic suppression, it seems as though it is business as usual for Europe. The European countries seem to be so eager to get their hands on Iranian market that they are prepared to not only ignore Tehran’s rogue behavior and its consequence for Western interests and the Iranian people, but also to trample on their own principles and values. This ignorance was on display this week when a Swedish delegation traveled to Iran headed by the country’s Prime Minister. Female members of the delegation had agreed, perhaps voluntarily, to cover their hair while they were in Iran. The film of these women marching before Rouhani could only be seen as humiliating for Europeans, surrendering to the demand of a fundamentalist regime has rightly been recognized as the leading state sponsor of terrorism. It is also insulting to the true Muslims who are dismayed that their religion is being misrepresented by forcing other women to act against their conviction only to appease the mullahs in Tehran. Europe is not only accepting humiliation but is also helping the very entity that is responsible for war crimes and support for terrorism. The IRGC, through its various subsidiaries, is currently dominating Iran’s economy. Minister of Defense Hossein Dehghan announced in early January 2017 that the main government plans regarding petroleum, gas, oil, transport, dams, water transfer, telecommunication and IT are currently assigned to Khatam-al Anbiya, a major corporation affiliated with the IRGC. The Europeans are fully aware that the Iranian companies dealing with them are affiliated with the IRGC. As one European businessman who had recently visited Iran acknowledged we could see that the decision makers are not those who were negotiating with us but the quiet man in the meeting who was from the IRGC. 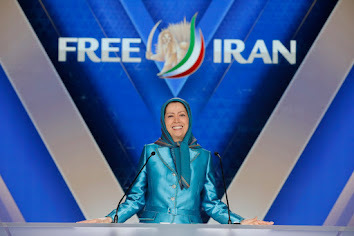 For many years through its network in Iran, the MEK has exposed mullahs’ secret nuclear weapons program being run by the IRGC, as well as IRGC engagement in terrorism, missile program and atrocities against Iranian peoples, but so far Europeans have decided to ignore these facts. It is time for Europe to end its deadly inaction vis-à-vis the IRGC and its policy on Iran. It is, indeed, time to revise its approach on Iran by looking beyond short term economic interests. The negative consequences far outweigh the short-term benefits of helping, through business, the leading state sponsor of terrorism and in particular its most suppressive arm, the IRGC. More important, European governments should realize that the clerical regime is very vulnerable and shaky at home. Europe should not put all its eggs in one basket, nor give away crucial leverage. It should be reminded that the clerical regime is desperately in need of relations with Europe, and could be forced to make important sacrifices in pursuit of those relations. 1. 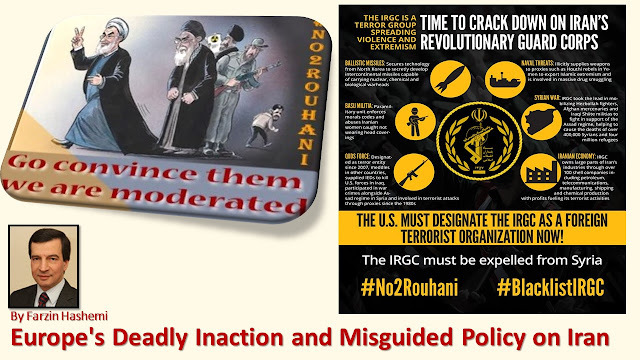 Stop all business with the IRGC and its affiliate companies, and make all trade with Tehran contingent upon its halting executions and ending IRGC meddling in other countries and support for terrorism. 2. Call for immediate removal of the IRGC and its affiliates from Syria, or impose punitive sanctions if Tehran refuses to do so.